WINONA LAKE – Several Grace College students recently spent their spring break in other countries serving others. The trip was organized by Grace Brethren International Missions. Teams are sent each year to countries where missionaries are placed and students assist them in their mission work. Grace College students are required to participate in a cross-cultural field experience either in the U.S. or another country before graduating. 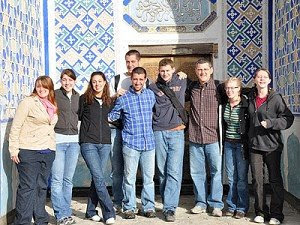 Scott Feather, dean of the chapel and global ministries, took a group of eight students to Central Asia. The students taught English and participated in a rock-climbing activity to reach people for Christ. During the trip, students were required to keep a journal detailing their experiences and had a debriefing when they returned to Grace College. “We were created to serve. The gifts and talents given to us by our creator are not for us, but for others,” Feather said. Feather said he hopes the students learn that God is at work all around the world. Andrea Ziegler, a junior business and education major at Grace College, was one of the eight students who served in southeast Asia. “It was a great and once-in-a-lifetime experience to teach people who didn’t know how to speak English,” Ziegler said. She said she enjoyed working with the other Grace College students teaching English to southeast Asia residents. Todd Shoemaker, a junior and youth ministry and counseling major, taught English to business professionals at a bank. He also worked with the other Grace students to invite college students in the country to a café to teach them English. The Grace College Chamber singers, led by Professor Ardis Faber, went to Seoul, South Korea. Dr. Paulette Sauders took a group of students to England where they spent time with Grace Brethren International Missions Missionary Tom Barlow in London. Professor Jacqueline Schram took an “I-Go-Pray-For-Paris” group to France. They joined Grace alumni Rob and Nichole Plaster in Paris for ministry, interaction with the French and cultural learning. Dr. Robert Peugh and Dr. Jared Burkholder and senior Peter Yaggi visited Germany for research, teaching and church ministry. Sound Investment, led by Tammie Robinson, traveled to Florida to minister through music to youth groups, schools and churches. The drama team Remnant, led by Andrew Jones and Bo Roseberry, traveled to Seattle and Los Angeles to perform for churches and schools.